News flash: David Beckham has admitted that he is addicted to tattoos. Well, you don’t say! David Beckham already has dozens of tats inked all over his body, including on his arms, back, neck, sides and chest, and it seems like he’s just getting started. God forbid he and Victoria have a few more kids…he’ll definitely run out of room on his body by then. While Beckham has devoted his chest and his back to his kids, and his left arm (and his heart…there we said it) to Victoria, David Beckham’s side tattoos tell a different story. So, if you want to learn more about the soccer phenoms views on life, death and loss, take a look at David Beckham’s side tattoos. Some of David Beckham’s newest tattoos are inked on his sides, which probably hurt a whole lot, considering they are inked over his ribs and all. But we have a feeling he thinks they were worth it. One of David Beckham’s side tattoos is dedicated to a loved one that Beckham lost in 2010, and another gives us a peek into David Beckham’s worldview and religious beliefs. 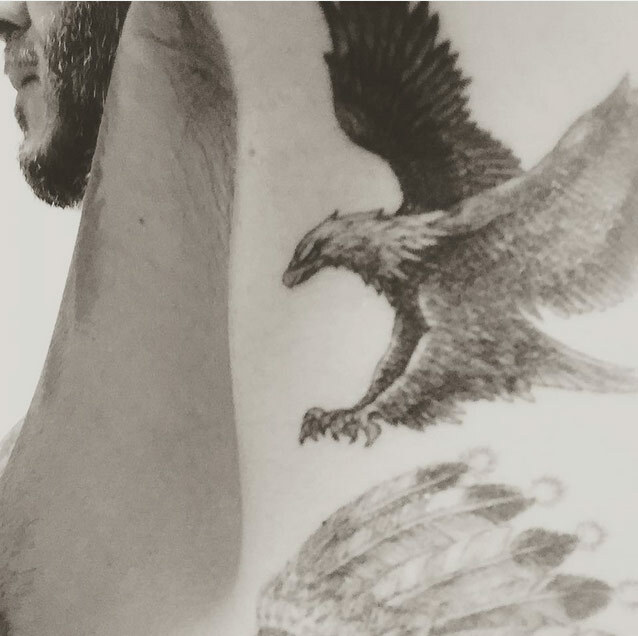 Whether you’re a David Beckham fan or not, you should take a look at David Beckham’s cool side tattoos. Although things were tense for a while between David Beckham and his father, following Ted Beckham’s split from David’s mother, Sandra, in 2002, the two have since made peace with one another, and David even went under the needle for a matching ship tattoo with his father. David’s tattoo tribute to his dad is inked on his right ribcage, just below his armpit, and features an old-school ship at full mast, inked in black and gray. His father has the exact same tattoo inked on his arm. On his right ribcage, just below the matching ship tattoo he has with his father, David Beckham has a large block of text that appears to be a Bible passage tattoo. David Beckham is a big fan of religious tattoos, and has several of them inked on various parts of his body, including a religious scene depicting Jesus being carried by three cherubs, a “Mans of Sorrows” tattoo depicting Jesus on his way to be crucified, and several others. During his daily Soul Cycle session in Los Angeles on August 4, 2015, David Beckham inadvertently revealed a never-before-seen tattoo on his left side featuring the head of an Indian chief. David Beckham’s tattoo is inked in black and white and is located below his left armpit and above his famous Chinese symbols tattoo on his ribcage reading “Death and life have determined appointments. Riches and hour depend upon heaven.” David Beckham hasn’t said anything in public about his Indian chief head tattoo, but we think the ink looks an awful lot like Justin Bieber’s Indian chief tattoo on the back of his shoulder. At a charity match in March 2008, David Beckham unveiled a large tattoo extending from just below his left armpit all the way down to his left hip. David Beckham’s side tattoo is written in a vertical string of Chinese symbols and translates to “Death and life have determined appointments. Riches and honor depend upon heaven.” The Chinese proverb was inked by a tattoo artist named Gabe at his tattoo parlor, Ace Dragon Tattoo, in Hong Kong, where the L.A. Galaxy made some pre-season appearances. According to a source who apparently knows all about David Beckham’s tattoos, “This tattoo uses a completely different technique to all the others. It appears on his skin as if it has been brushed on. It is a really intricate process and unique to Hong Kong.” Apparently, having David Beckham show up for a tattoo is also pretty unique in Hong Kong. When Beckham’s assistant called Gabe to make an appointment for the soccer star, the tattoo artist apparently thought it was a prank and hung up. It wasn’t until Beckham showed up a few days later flanked by body guards that Ace Dragon Tattoo knew this guy was for real. 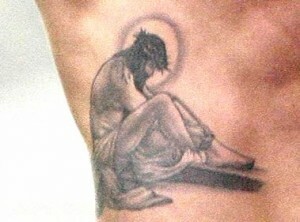 Although David Beckham’s side tattoo depicts Christian iconography, the tat may not actually be a hint at his religion. In his first biography, My World, Beckham revealed that he actually has a strong link to Judaism. “I’ve probably had more contact with Judaism than with any other religion,” he wrote. “I used to wear the traditional Jewish skullcaps when I was younger and I also went along to some Jewish weddings with my grandfather.” In honor of his Jewish roots and as a tribute to the man for whom David Beckham got his Man of Sorrows tattoo, Beckham wore a blue yarmulke to his grandfather’s funeral in December 2009. David Beckham’s side tattoo is inked above his right hip and was first spotted when Beckham took off his shirt after AC Milan’s 3-0 win over Juventus in January 2010.